I decided to give my gauzy white summer skirt one last spin before I put it away for the season. I wanted to “fall it up” a bit and this is what I came up with … kinda Little House on the Prairie-ish, but it made me happy wearing it! Well, I did spend a lot of time watching that show as a child! So Dolls, are you giving any of your summer clothes a last hurrah and/or a bit of a fall makeover? What I Wore! Because Shanna Said So! Tres-chic Thursday! What Wives Wear! Thursday Favorites! Throw Back Thursday! Reasons to Dress! Passion for Fashion! Fashion Favorite Friday! Love this. Perfect use of a summery white skirt for fall! So pretty and I LOVE your boots! I've been wearing my white jeans quite a bit this last month, before they go away until the spring! Thanks, Lana! Found these boots on sale at the end of the season last year and didn't get to wear them too much, so can't wait for some fall weather! Oh, fellow Cali girl! Of course I give all my summer clothes a last huzzah. In fact, even though Monday was the first day of fall (if the Google graphic was to be believed), all my pre-planned outfits for the week still utilize my summer wardrobe. Vive la chaleur! Where in Cali are you, dear? I'm in Los Gatos, right by San Jose. Thanks, Andrea! This Oryany bag is one of my favorites splurges! Such a cute look! I love long skirts, they are comfortable and feminine; all at the same time! It's warm here in Los Gatos too … sigh …. What a perfect idea … this skirt with a chunky fisherman sweater! You're a fashion genius my dear! Please send us some monsoon! We're in the middle of such a bad draught here! Do do do do do-do… Do do do do do do, dodo.. Sorry you made me think of that theme song .Pretty look, Love the boots great color and the jean jacket is fab with it! You are one chic and on trend member of Little House on the Prairie! Ha!! I love this and it is fall perfection…classy!! Hee … thanks a million, Shanna! Such a great look as we transition from summer into fall. Now I wish I had a white skirt to autumn-ize! Hee … you're cute! Muah! Good for you for wearing White in the Fall, besides the street style pictures that came out of the milan fashion week were FILLED WITH WHITE, so you are totally on trend. Besides this is such a nice and mild fall that i say wear those summer items as long as you can! I hope you can come by and join my #reasonstodress Real Mom Street Style linkup. I am also hosting a giveaway for a $600 custom sized Italian leather belt (hand made). I would be honored if you could come by! Dawn I'm so glad you linked this look up it is stunning! I hope you can join again next week, or feel free to add in more than one link! great skirt! Love the vibe! 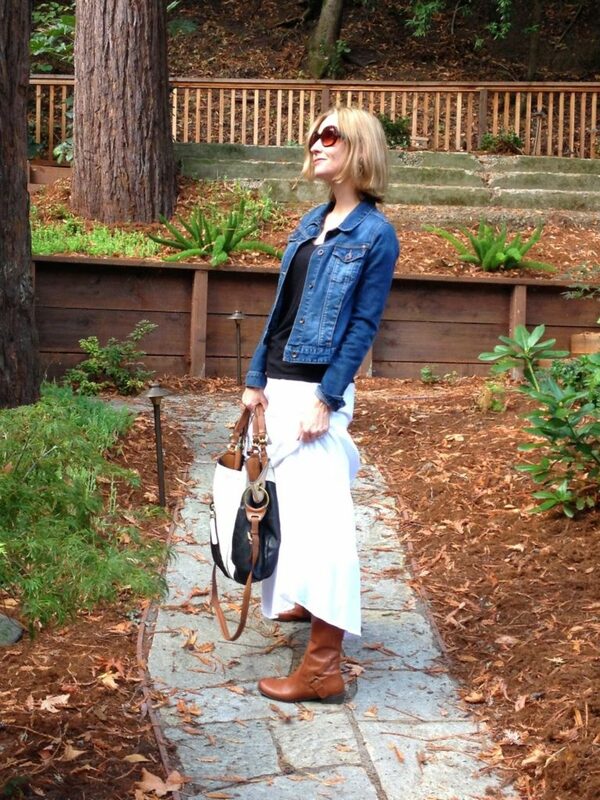 I have a long white skirt that I love wearing with boots in the fall! Great, fresh look. The title made me laugh:) Really love how you styled this white maxi for fall!! Hope you are having a great week Dawn Lucy. Following you as well! Yay! Muah! Good pairing! I have several items I keep thinking I want to wear one more time. Happy Friday! Have a great weekend, Amy Ann! I'll stop by your blog for sure! Thanks so much, dear! A denim jacket and boots can transform an entire outlook magically. Loving this skirt on you. It is so fun to style long skirts for the fall! The boots and denim jacket are perfect with it! I keep seeing other bloggers wearing white, yet adjusting it for the fall… such a great idea to get more use out of the white items in our closet! Thanks so much, Carrie! Yeah, I'm not sure what made me think of this, but I threw it together and liked it! This is my favorite! 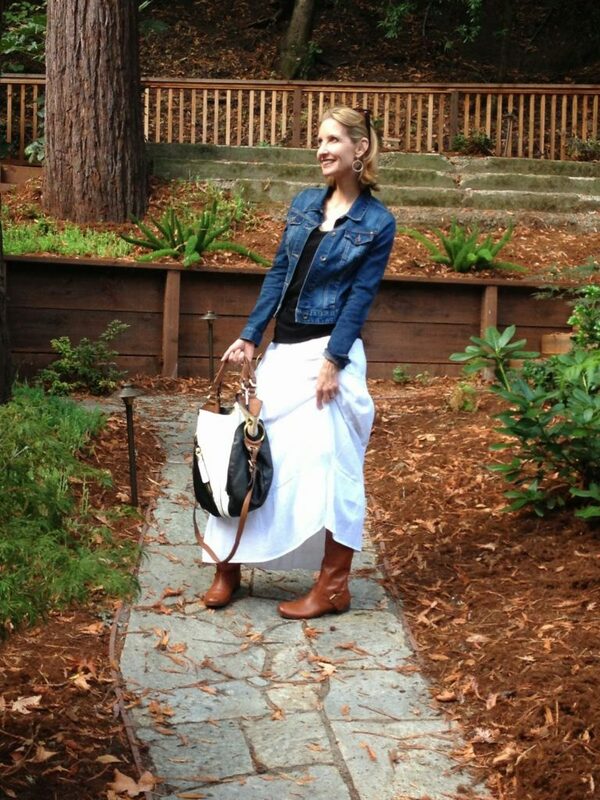 I love the long white maxi with the denim jacket. So bohemian and pretty. I plan on wearing my summer maxis all winter. If we ever get a winter here. Yay for boho prettiness! Muah muah! I love your boots with those cute buckles and that bag is AMAZING! So much fun! 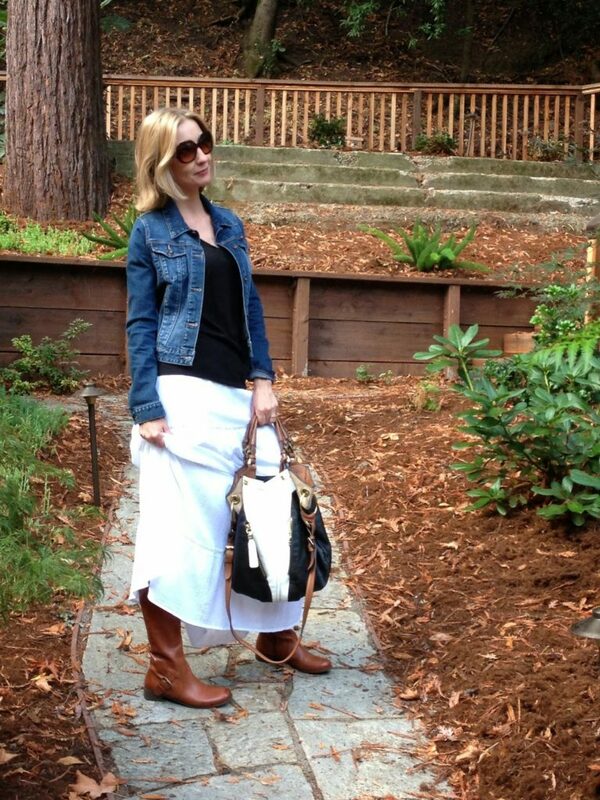 Love this white maxi and how you transition to fall. Great boots!! Thank you for much for linking up to TBT fashion and hope that you will join me this Thursday. Thanks, Alice! I'll see ya tomorrow for TBT! Aww, thanks a million, Kimi dear! Jealous of your fall weather! Still so hot here! Argh! I, too, loved that show. And I still have my set of the "Little House on the Prairie" books, which you probably do as well. But I must say, you look way too stylish to fit into that category. This look is just awesome, in fact I just might be copying it today. Hee … thanks, Trina! That's always the best compliment of all! Muah!